‘Green Valley is the most prolific [of the West Sonoma Coast subzones] in styles, wine types, and producers’, Paul Sloan, viticulturist and winemaker of Small Vines, explains. He’s been farming the region since the late 1990s. Even more impressive is that even within the range of styles, a Green Valley signature still shines through. Natural fruit-spiced warming aromatics and palate. All about the spice moving into a long finish. Fresh clean fruit, creamy Meyer lemon with hints of lime. Lots of presence, and freshness. Will age and develop nicely. Notes of mixed fresh berries, natural spice and pine forest through the finish with a mineral crunch. There is nice density and depth here. This Pinot shows off the sophisticated structure and flavour nuance of the vintage. Will develop nicely. Chiseled, savoury rose leaf and cream and a saline crunch. Nice flavour concentration, structural tension, and fruit purity. Long mouth-watering finish. Savoury with a saline crunch. Notes of dried rose petal, and herbs smudged with spice. Lots of lifting energy, flavour concentration without heaviness, and clean focus. A little more breadth and depth to the palate than the other Small Vines Pinots. This wine wants the most time in bottle to develop. Savoury red fruit with integrated spice, and a long mineral crunch. A bit muted but opens with air. Nice flavour concentration without heaviness. Mouth-watering acidity with persistent tannin, and an ultra-long finish. A mysterious apple tree taught Paul Sloan his first lesson in winemaking when he was 10 years old. “For whatever reason, that tree with the smallest apples had the flavors that were the most intense,” he said. Today Sloan and his wife, Kathryn, are the vintners of Small Vines, a Sebastopol brand that is based on the Burgundian model of winemaking and vineyard management. The philosophy embraces the practice of getting smaller yields from higher-density, European-styled spacing of vines. The Sloans say they reap fewer pounds per vine in order to produce higher quality fruit. It’s a nod to the tasty apple tree Sloan grew up with on his family’s 250-acre ranch in Santa Rosa. The couple sit beneath a grove of redwoods on their property in Sebastopol. It’s a 12.5-acre spread, and they’re in the midst of building a winery not far from their house, the historic Barlow homestead that dates back to 1897. The Barlows were prominent apple and berry farmers. Today the family name is well known for its apple processing plant in Sebastopol, which has been transformed into a food and wine haven with wineries, retail shops, artisan studios and restaurants in the mix. Kathryn, 45, said living in a historic house suits the family, most especially their two children: Dakota, 11, and Savannah, 8. It all began with a fascination of pinot noir. Sloan, 42, was a 19-year old busboy at the Kenwood Restaurant, and then owner Susan Schacher had a daily ritual of reveling in a glass of pinot noir at closing time. “I said to myself, ‘This pinot noir varietal has to be very special,’ ” he said. While working at John Ash, Sloan was offered a taste of a $3,000-plus bottle of Burgundy — the Domaine de la Romanee Conti. After working for the late Warren Dutton of Sebastopol’s Dutton Ranch and studying viticulture at Santa Rosa Junior College, Sloan was at a crossroads. He was accepted to study at California Polytechnic State University, but he was eager to begin his brand. Dutton, who mentored the couple, encouraged them to travel to France, since they wanted to follow the lead of the French. After several research trips, the Sloans founded Small Vines in 1998. The husband and wife team seems to be the perfect yin-yang for the operation. Sloan covers farming and winemaking, while Kathryn tackles the business side of the operation. Meanwhile, both continue to be adventuresome, which isn’t surprising considering they began their courtship as rock climbers. Small Vines Wines owners Paul and Kathryn Sloan imported special tractors from Europe designed to work in the narrowly planted vines. This 2014 vintage is my first harvest with Small Vines Wines, and as an assistant to two very knowledgeable and friendly owners, Paul and Kathryn Sloan, I have had the opportunity to experience and be exposed to every aspect of the harvest process; sampling, planning, picking, harvesting, sorting and repeat. Many people have heard horror stories of zombie-like winemakers and grape growers going through the crush process, but few people are able to see some of the behind-the-scenes of what goes into each and every bottle of wine. It all begins here, when the grapes transform colors from green to purple, this is the beginning signs of veraison, the onset of ripening, and an indicator that the crush is approaching. At this time, we begin to count clusters, sample grapes, drop fruit and analyze. I am lucky enough to have two very knowledgeable and helpful sidekicks, Dakota and Savannah Sloan, who have more experience than me at the ages of 11 and 8 respectfully. This sampling process happens more frequently as we approach our estimated picking dates. On any typical day during harvest, you can find me up and on the road before the first sign of the sun peaking over the Mayacama Hills to the east of Santa Rosa. When collecting samples, it’s ideal to sample in the early morning when the grapes are cool, which will give an accurate representation to when we pick, as we hand harvest our grapes in the middle of the night. While out sampling, It is essential to always have with me a pack of gallon size zip-lock bags, a pair of pruning sheers, a black sharpie, some water, an ice chest to keep the samples cool and of course my cell phone with GPS accurate directions and vineyard maps to identify our vineyards and differentiate the clones. These days begin to blur and become a routine of traveling from vineyard to vineyard and walking row by row. In order to get a varied sample with an accurate reading of degrees brix (sugar levels) and taste profile, you must collect grapes from all areas of a vineyard. No skipping out or shortcuts here whatsoever. This is an extremely crucial task during harvest as these are the numbers we schedule our picking around. After we read the degrees brix from the samples, we taste and analyze. Wine is a mix between art and science, and with Small Vines Wines we incorporate both to create some of the best wines in the area. Being in the wine industry, you look forward to the long hours of fall as the leaves change colors and the grapes turn to wine, but every year is different. This year being a rarity of record early picks in such a condensed and short amount of time it has been a lot of work, but it all pays off when you taste that fresh Pinot Noir or Chardonnay juice turning into wine- this is what we live for. This post is a bit late, due to some re-configuring and redesigning of our new website and blog, as well as harvest and some vacation, but who is making up excuses. We are proud to show off our second Wine of the Week honorable mention from Peg Melnik in the Press Democra with the 2012 Small Vines Wine Sonoma Coast Chardonnay! This exceptional Chardonnay is 100% from our Barlow Homestead Vineyard. From obsessively tended vines, it expresses a distinct sense of place. It confidently delivers pleasing minerality with subtle richness. We only have a handful of cases of the 2012 Sonoma Coast Chardonnay. Order yours today at www.smallvines.com. Wine writer Peg Melnik had a blind tasting this week with a flight of white wines to relish the final days of summer. Bottlings included a broad range, from sparklers to chardonnays to sauvignon blancs. Our wine-of-the-week winner is the Roederer Estate, N.V. Anderson Valley Brut at $24. Roederer Estate, N.V. Anderson Valley Brut, 12 percent alcohol, $24. ★★★★ An elegant sparkler with complex notes of pear, hazelnut and mineral. It’s light on its feet with great acidity. Impressive. A smart pick for the price. Iron Horse, 2009 Green Valley of Russian River Valley, Sonoma County Brut Classic, 13.5 percent, $40. ★★★★ 1⁄2 This is a striking sparkler with great complexity and a seamless texture. It’s lush with notes of baked apple, brioche and nut. Nice mousse. Lingering finish. Outstanding. Ousterhout, 2013 Redwood Ranch, Alexander Valley, Sonoma County Sauvignon Blanc, 13.5 percent, $22. ★★★ 1⁄2 A refreshing sauvignon blanc with a range. Its breath of flavors is what gives this wine its intrigue. Notes of grapefruit, mango, papaya and lemon peel. Bright finish. Tasty. Small Vines, 2012 Sonoma Coast, Sonoma County Chardonnay,13.8 percent, $53. ★★★ 1⁄2 A tasty chardonnay with depth. It has bright fruit, good minerality and crisp acidity. Seamless and complex. La Crema, 2013 Monterey Pinot Gris, 13.5 percent, $20. ★★★ A tropical pinot gris with aromas of pineapple, apricot and lemon zest. Bright acidity. Nice length. A refreshing summer pick. Bacon makes everything better. That is not an opinion, that is a fact. 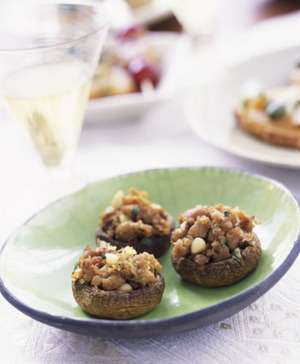 These savory, tasty stuffed mushrooms are filled with a mixture of bacon, cream cheese, and bread crumbs and are a perfect appetizer to pair with any of Small Vines Wines’ Pinot Noirs! Clean mushrooms, remove and chop stems; set aside. Fry bacon in a heavy skillet. Remove with a slotted spoon and set on paper towels to drain. In bacon drippings, saute onion, green pepper, and chopped mushroom stems until tender; drain. Add salt and pepper. Soften cream cheese; blend in cooked bacon and vegetables. Press mixture firmly into mushroom caps, mounding a bit. Place bread crumbs in a small bowl. Turn filled mushroom caps upside down and press gently in the bread crumbs to coat tops. Place in a 9 x 13 x 2-inch baking dish. Add hot water to pan and bake, uncovered, 20 to 25 minutes at 325 degrees. Makes about 2 1/2 dozen stuffed mushrooms. 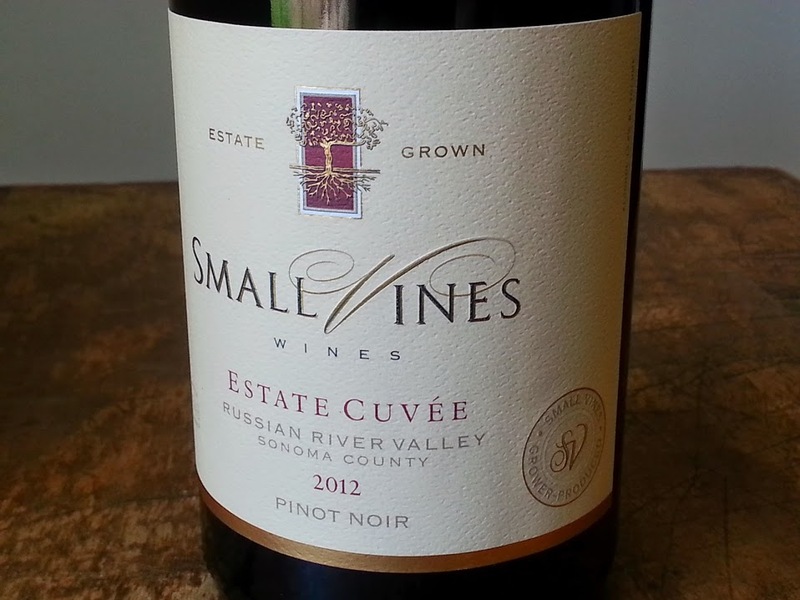 2012 Small Vines Russian River Valley Estate Cuvée Pinot Noir. This may be one of my favorite food pairings to showcase the significant versatility of our 2012 Russian River Valley Estate Cuvée Pinot Noir. It combines Pinot’s affinity for both the smoky flavors of bacon and earth-bound melodies of mushrooms into a delicious (and easy) appetizer. The often lighter-style, subtle tannins and juicy acidity give Pinot Noir a leg up when pairing with the likes of mushrooms, bacon and even onions. This appetizer is always a hit with the host and guests alike. It’s a snap to make, downright delicious and offers a great introduction to the basics of food and wine pairing when served alongside a slightly chilled glass of 2012 Small Vines Russian River Valley Estate Cuvée Pinot Noir. We recently received this wonderful review from a Pinot Noir lover who hosted a wine and dinner pairing party in Southwest Florida. They reviewed wines from Sea Smoke Estate Vineyards, Peay Vineyards and also our very own Small Vines Wines all from the 2008, 2009 and 2010 vintages. We would like to thank Linda for writing this great review and loving all of these fantastic California wines. Below is her review. “On May 18, my husband and I, plus 6 of our wine and food loving friends, had a California Pinot Noir vertical wine tasting and dinner. They were all 2008, 2009, and 2010 vintages as well as some of our favorites! We started off with 3 years of Sea Smoke Ten, moved up the coast and poured 3 years of Peay Scallop Shelf, then dove right into Russian River Valley with 3 years of Small Vines Wines. Of course all of the wines were fabulous and they paired beautifully with everything from wild mushroom soup, seared tuna, salmon in raspberry glaze, to pork tenderloin in blueberry glacé and grilled lamb chops. I did have to move over to Napa for dessert as we had a Vineyard 29 Aida late harvest Zinfandel that certainly was delicious with my torta de Barozzi. Everyone raved about our pinots and rightfully so. We have visited with both you (Small Vines) and Andy Peay (Peay Vineyards) and love your wines. While we are not big wine collectors ( just a lowly 500 bottle collection) we always purchase a few every year. Please keep those great wines coming. I have attached a few pictures. Some of us in Southwest Florida really love great wine and food!!!! Our 2012 wine vintage reviews from Josh Raynolds at Stephen Tanzer’s International Wine Cellar are in. For in-depth professional reviews and scores see the PDF link.